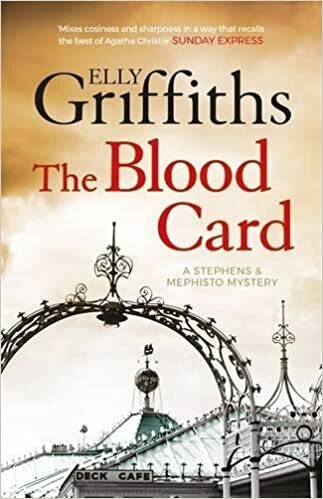 The third novel in Stephens and Mephisto series, The Blood Card mystery takes us once again to 1950s Brighton where Detective Inspector Edgar Stephens' team is called on to investigate the death of a Romany fortune teller, Madame Zabini, while at the same time Edgar is also drawn along with his friend, renowned stage magician Max Mephisto, into an additional mystery surrounding the death of the man who was once their commanding officer during the war. Britain is building up the coronation and Max, currently enjoying something of a career renaissance, has been booked to headline a TV variety show to follow the coverage of the event itself. I won't reveal how these plot strands come together, but they certainly do so in a tense and thrilling climax. Although set like the rest of the series in Brighton, this book embroils Edgar and Max in what might just turn out to be an international case, with Edgar making a trip to New York that brilliantly evokes the sheer novelty and glamour of international travel in the Fifties. A few ghosts from Edgar and Max's past also resurface. The Blood Card also builds on the solid character foundations established in its predecessors. Emma Holmes, one of Stephens' sergeants, is still in love with him - not that Stephens knows this, because he's still besotted with Ruby, Mephisto's daughter, to whom he's now engaged. But does Ruby ever really intend to marry Edgar, or would marriage be incompatible with her ambitions for stardom? In the meantime, Max himself is uneasy not only about the rise of television at the expense of variety theatre, but also about working with Ruby - he's not used to sharing the limelight, and he's not convinced he ever wants to be. Max, to me, is probably the series' most interesting character - there's more ambiguity about him than Edgar and his relationships are perhaps more nuanced. The supporting characters, among them Madame Zabini's Romany family, are also fun, and I suspect there's probably more mileage in them for future books. The plot, as always, is frankly barmy, but somehow also perfectly easy to take seriously. In short, this is great fun and a great instalment in a strong series.